I love being able to share my friends' good news. Love. 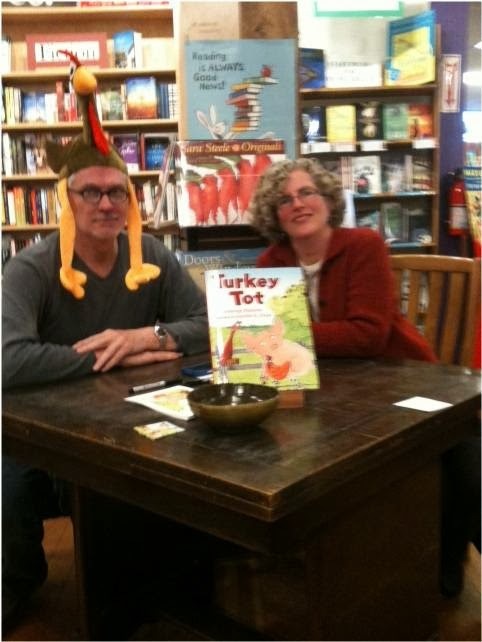 This post is extra fun because my news about one book, TURKEY TOT, involves good news for two friends. How cool is that?! TURKEY TOT was written by George Shannon and illustrated by Jennifer K. Mann. George is a dear friend, and he kindly granted me an interview a couple years ago that you can read here. Jennifer is also a close friend, and she's one of my critique partners. This is her first published book, and the fact that George is the author makes it extra special! Jen has more excitement on the horizon. She has another book coming out in the spring of 2014. 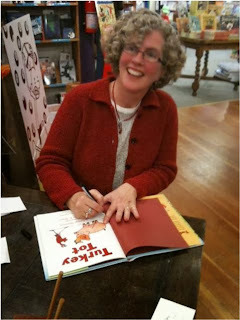 TWO SPECKLED EGGS, a picture book written and illustrated by Jennifer, will be published by Candlewick Press. The launch party for TURKEY TOT was held at Eagle Harbor Book Co. on Bainbridge Island last Sunday. Of course Margaret Nevinski, our other amazing critique partner and buddy, attended as well, and we had such a great time! I love getting a book autographed by the author and illustrator even if I don't know either one. Knowing one of them is special. Knowing both? Special x 2! TURKEY TOT is a darling picture book. I bought one copy for myself and one for a special group of kiddos I know. George was the first person to teach me about the importance of rhythm in prose, and TURKEY TOT flows beautifully and has oodles of heart. Jen's illustrations are delightful, and they match George's words, being full of warmth and sweetness. A determined turkey gets the sweet, juicy, high-hanging berries. 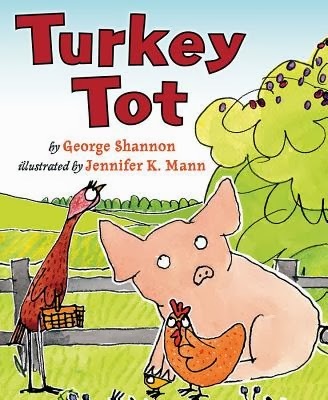 Turkey Tot is wandering about the bucolic farmstead--the reader winningly transported there via Mann's easy-handed, dark-lined, watercolor-washed artwork--where he lives with his friends Chick, Pig and Hen, in search of something to eat. Blackberries beckon, but they are too high to reach. So Turkey Tot looks about for some way to access the berries. His friends think all of his ideas are cockamamie--and repeatedly so in Shannon's polyphonic refrain: "You're talking silly talk." "We can't reach the berries, and that is that." "He's been different since the day he hatched." They decide to take a nap by the pond. But Turkey Tot will not be discouraged. Perhaps his first few ideas are a little off note--one has him finding a ball of string to which, he figures, he will tie a balloon and float Pig up to berryland--but he finally manages to wire all his different schemes together and snag the berries. Then he shares them with his uninspired comrades, which is more than the Little Red Hen would have done. Good for Turkey Tot: freethinking, resolved, generous. Let's hope that when November rolls around, Turkey Tot has become the farm's mascot, not its dinner. Turkey Tot thinks outside the box. He's hopeful, imaginative, and persistent, refusing to let his Debbie Downer friends in the farmyard discourage him. He's determined to retrieve juicy blackberries that hang just out of reach, but he needs a little help to implement the plans he makes to get within range. His enthusiastic schemes include floating up to the berries via a bunch of balloons and being flung at them from a teeter-totter. Naysayers Pig, Hen, and Chick tell him no way, no how. No matter, because Turkey Tot pulls together materials to make a pair of stilts from tin cans, and he fills a basket with the plump berries on his own. Now, his detractors sing a different tune. Hen's observation that Turkey Tot has been "different since the day he hatched" is no longer a criticism but a compliment. Shannon's writing is simple, clean, and cheerful, and his message of stick-to-itiveness is delivered perfectly. He also incorporates refrains that kids will have fun repeating during storytimes. Mann's illustrations, a blend of watercolor, pencil, and digital collage, pop against ample white space, and the four characters are depicted in wonderfully silly and endearing style. 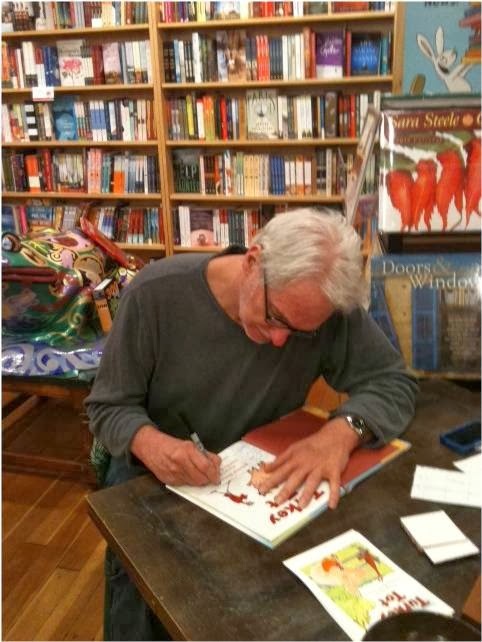 This picture book, like its protagonist, is a bona fide winner. Way to go, Jen and George! I feel so inspired when I see people working hard at this dream and then having the dream realized. It's huge! Congrats to my published friends and colleagues who are on their way, and an equally heartfelt congratulations to my not-yet-published friends and colleagues who, like Turkey Tot, are sticking with it! It's a journey. Keep reaching for the stars, my friends.